This superbly finished stand is really handy. It has four lockable castors that allow you to manoeuvre the bike around easily, even if the rear wheel is removed. It also lets you move the bike to fit it into a small space. It is large, heavy and the most solid rear stand on test – there are not many others you would feel safe sitting on the bike with. It comes with either forks, lifting bobbins, or with under-swingarm cups. If you get it with one set, you can always buy the other. The only downsides are that lining the forks up with the bobbins is a bit fiddly and the first part of the lift isn’t the easiest here. Once rocked onto the wheels it becomes much easier. It works a charm on a tiled floor, but the plastic wheels are a bit tricky on the bike ramp. 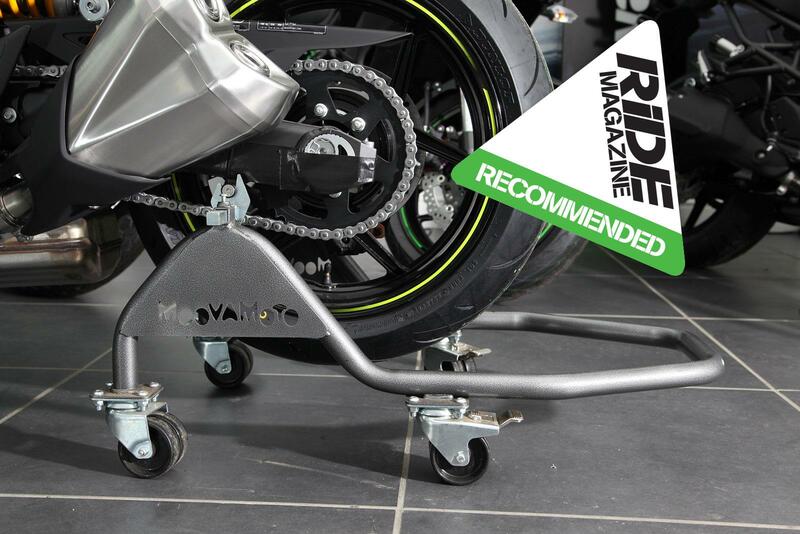 Ride magazine have been testing motorcycling products since 1995. The Best Buy and Recommended green triangles are only awarded to products that exceed expectations in both quality and value for money.